Last week I visited family in Los Angeles, and we took my son and his cousins to Disneyland. My two favorite rides there are Pirates of the Caribbean (of course) and It's a Small World. Small World is a boat canal ride through scores of animatronic singing dolls that represent the children of the world with a message of global unity. 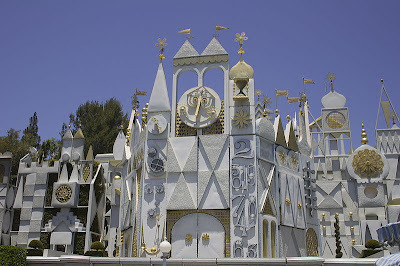 On the one hand, Small World epitomizes the sanitized worldview that Disney is so often criticized for; on the other, it is the pinnacle of what has made Disney so beloved — entertainment executed with bravura design and craftsmanship. white, silver, and gold, with interest added through an intense use of texture. I also love how this contrasts with the interior, which is a riot of color. At night they throw some colored light on for a nice effect. I haven't ever seen photos that do justice to the interior spaces of this ride. These are can-can girls representing France. For the design of the attraction, we have Mary Blair to thank. 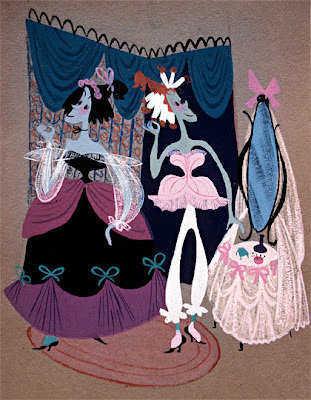 Mary was a Disney art director and worked on several films, such as Cinderella and Peter Pan. She was an underappreciated genius, in my opinion. 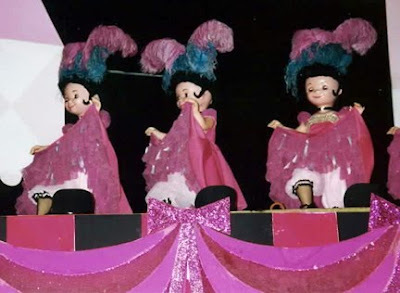 The dolls in this ride are too cloying for my taste, but I completely dig the 1960s design of the building and the sets within the ride. I've been to Disneyland many times, and my eyes are always eager to gobble up all the awesome color combinations and patterns in Small World. I always wish I'd brought a camera with me to help me remember what I've seen. According to Amid Amidi's excellent blog Cartoon Modern (cartoonmodern.blogsome.com), much of the work that Mary contributed to Disney was inspirational in nature, and she wasn't ever given a chance to fully put her aesthetic stamp on a movie. 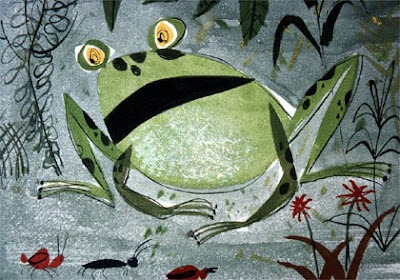 The following art is from Amidi's posts during the "Mary Blair Week" he did on his site. If you want to learn more about Mary Blair, there is a book of her work entitled The Art and Flair of Mary Blair by John Canemaker. Alethea, great stuff! As a kid growing up in the LA area, I was lucky enough to get to go to Disneyland many times. Small World was always my favorite, and you've given me a wonderful sweet memory of watching the "clock" on the silvery outside while climbing out of my skin in anticipation in line. 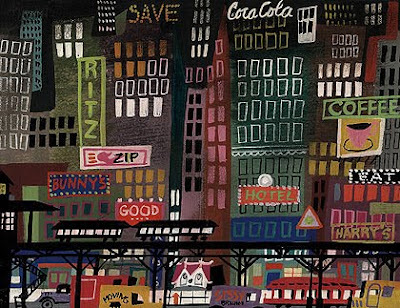 Thanks for letting us know about Mary Blair! I will definitely investigate her more.